Composite articles are also known as soft composite materials. The soft composite materials for electricians are mostly made of polyester film, polyimide film, natural fiber insulation paper and synthetic fiber insulation paper, which are impregnated and pressed. The composite material has the comprehensive properties of the film material and the fiber material, and obviously improves the tear resistance and impregnation property of the insulating material, and has better performance than a single material, and is convenient to use. Its products mainly include poly insulating film composite products, ester film insulating paper composite materials, polyester film polyester fiber paper composite materials, polyester film aramid fiber paper composite materials and polyimide film aramid fiber paper composite materials etc. 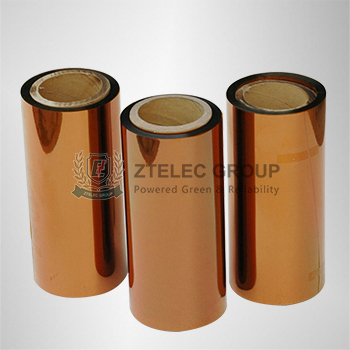 A layer of polyester film with a thickness of 25um, 36um, 50um and a layer of insulating paper (green paper) are bonded with a binder, and the thickness is 0.1-0.6 mm. The soft composite material has good electrical performance, high mechanical properties, good tear resistance and certain stiffness. It is mainly used for E-class motor slot insulation and end insulation, and the long-term working temperature is 120 °C. It is made of polyester fiber paper with a thickness of 50um, 70um and 100um and a polyester film. The thickness is 0.1-0.45 mm. The composite material has good electrical and mechanical properties, excellent tear resistance and good impregnation. Mainly used for Class B or Class F motor slot insulation and end insulation, long-term operating temperature is 130 ° C or 155 ° C.
It is made of two layers of aramid fiber paper and a polyester film with thickness of 25um, 30um and 50um, and the thickness is 0.2-0.53mm. The properties of this material are compounded with polyester film polyester fiber paper. The materials are similar, the heat resistance is good, and the compatibility with the insulating paint is good. Mainly used as Class F motor slot insulation and end insulation. The polyimide film is made of aramid fiber paper on both sides, and has four thicknesses of 0.2 mm, 0.23 mm, 0.3 mm, and 0.33 mm. This composite material has excellent electrical, mechanical properties and heat resistance. It is mainly used for H-class motor insulation and dry-type transformer insulation. The long-term operating temperature is 180 °C.